This post was sponsored by Simplicity. Thank you for supporting the brand partners that make A Little Craft In Your Day possible! You guys- Christmas is coming up and if you are anything like me you still have people on your list that you have no idea what to give. If you know how to sew (or want to learn in the next week or so) this post may help you get a few more people checked off. I have 3 super cute gift ideas that you can sew up with Simplicity patterns. All 3 patterns are also available in Cricut Design Space, so if you have a Cricut Maker they will be super fast to make with it. First up is the adorable Envelope Clutch. I love this pattern because it is the perfect size and the finished product comes out so nicely. This would be great to give to a teen girl or young woman on your list! I Hacked this project a little bit because I didn’t want the bottom to show on the front, but if you do be sure to follow the actual pattern. Step 1- Place the fabric/ interfacing onto the Cricut FabricGrip Mat following the directions in Design Space and have the Maker do the magic of cutting the pieces out perfectly and drawing marks that will help you along the way. Step 2- Iron the fusible interfacing onto the back of the coordinating pieces of fabric. I love that they are both marked with the same numbers so there is no way to mess it up. Step 3- Place the flap piece and the front + back piece right sides together with the notches lined up. Sew them together along the drawn line. Step 4- Place the lining and the piece that you sewed together in step 3 right sides together and sew them together along all sides but leave a small opening along the bottom edge. Trim the corners. Step 5- Turn it right side out using the opening. Press it so that it is nice and crip. Fold the front of the bag up using the fold line and sew up both of the sides. Lastly, hand-sew the magnetic snap on. Step 1- Place the fabric onto the Cricut FabricGrip Mat following the directions in Design Space and have the Maker do the magic of cutting the perfect piece out and drawing helpful lines. Step 2- Fold the fabric along the drawn lines and use the iron to press it. Step 3- Place the fabric on top of the webbing and center it. Sewing them together along both edges of the fabric. Step 4- Cut off the excess webbing on both ends. Step 5- Fold it in half and place the ends inside of the key fob hardware. Use the pliers to close it with fabric and webbing secured inside. Last, but definitely not least, a DIY fabric Gift Basket! Made with the right fabric, this would be great for anyone from kids to adults. 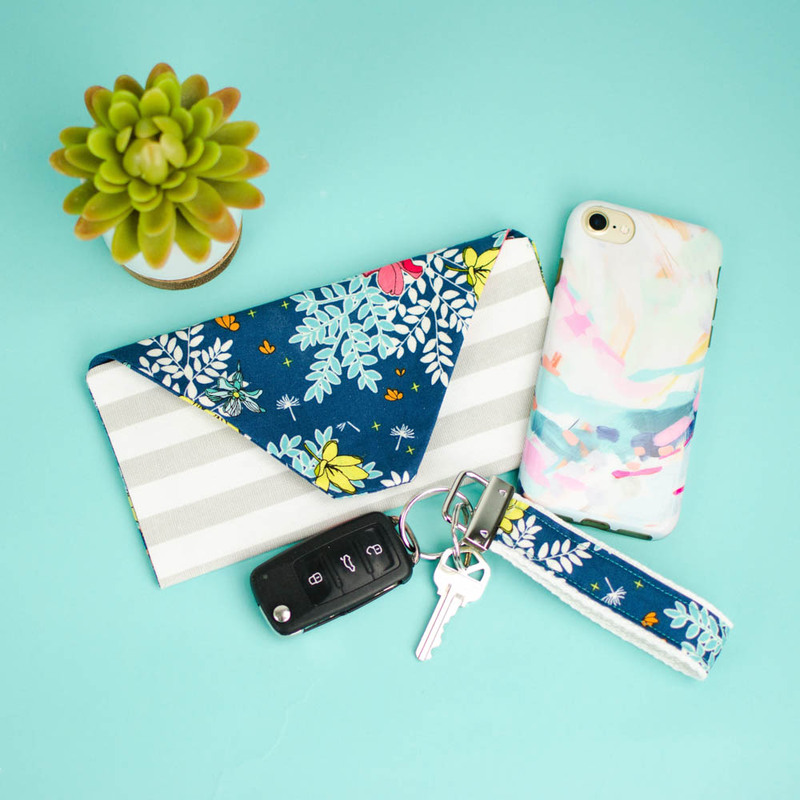 Place a few little items that they will like inside or even the key fob and envelope clutch for the ultimate gift! I hacked this one a little bit but if you want to make it the grommets, be sure to follow the actual pattern. Step 1- Place the fabric/ stabilizer onto the Cricut FabricGrip Mat following the directions in Design Space and have the Maker do the magic of cutting the pieces out perfectly and drawing marks that will help you along the way. Step 2- Stich along the dotted lines on the inner basket piece. Then place the inner basket and outer basket pieces right sides together and stitch around the edges. Trim the corners. Step 3- Turn the basket right side out through the opening and insert the stabilizer so that the fusible side is against the outer basket. Step 4- Stitch a top stitch all the way around. Step 5- Press under one side of the opening and overlap the pressed side over the raw edge. Stich the pressed edge in place. Press the stabilizer in place. Step 6- Add a clip two inches in from each corner and sew a line straight down to give the basket it’s shape. There you have it! 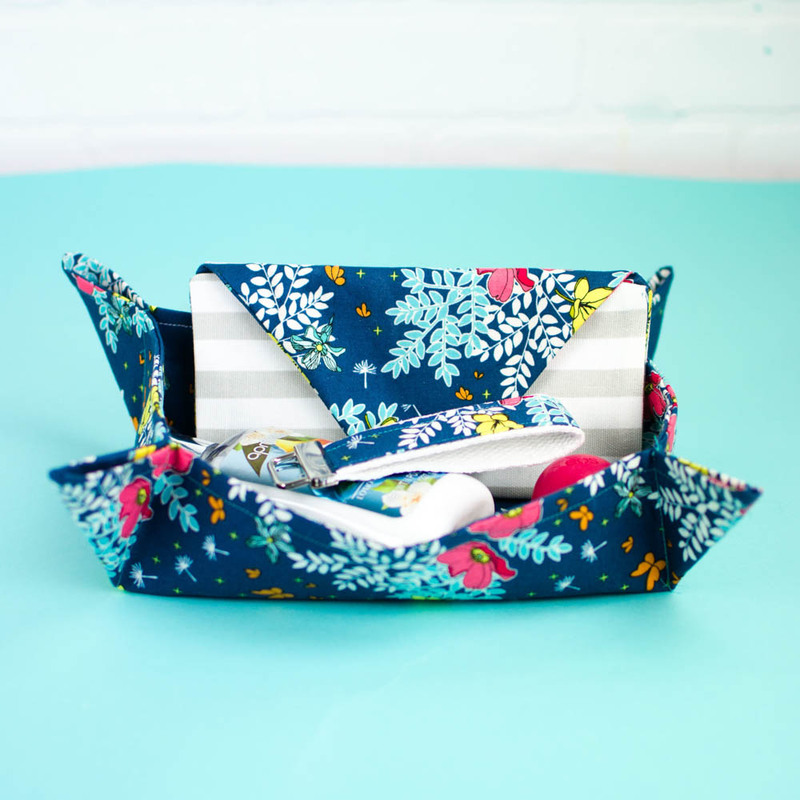 Three great gift ideas that you can sew today! 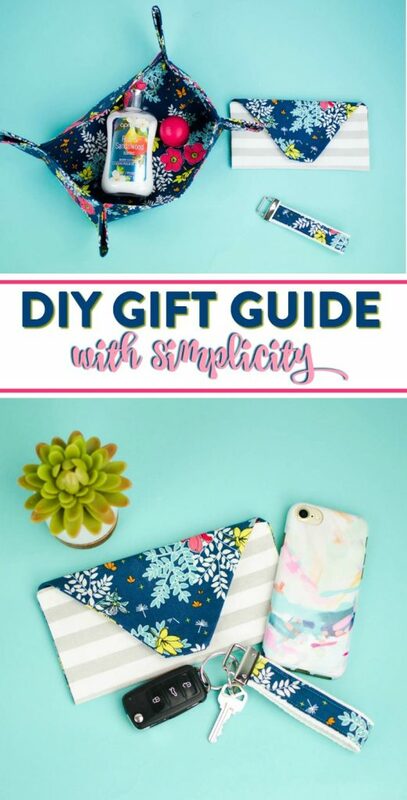 There are lots of other Simplicity patterns in Cricut Design Space that could make good gifts also- check them all out!